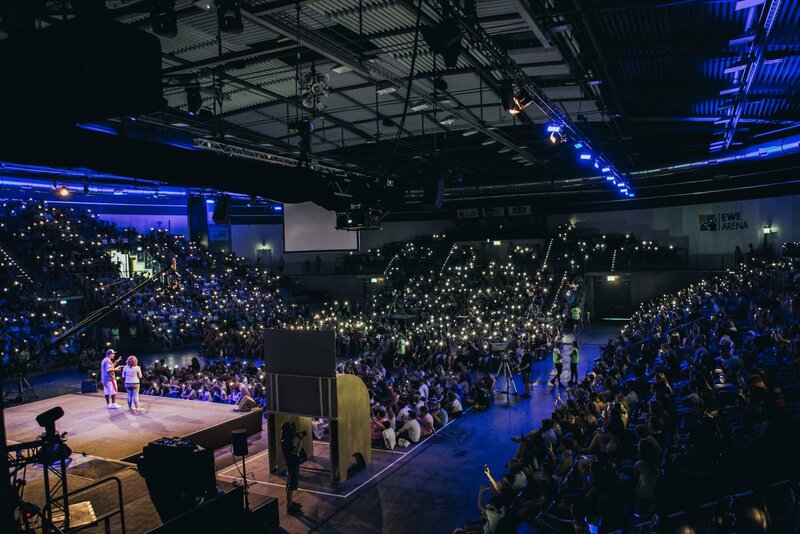 3,200 teenagers and adults from all over Europe (and beyond) came together to TeenStreet (TS) 2018 in Oldenburg, Germany—a week full of worship, Jesus, passion, life and fun. As different as all the countries, cultures, backgrounds and churches might be, one thing connects everyone at TS: they know Jesus and want to grow closer in their relationship with Him. But this is not true for 2.8 billion people in this world, who have never heard the name of Jesus. Never! This year’s Global Village (GV) at TS focussed on these people. Teenagers boarded a train with Scatter Railways, the GV train company, and ended up in an environment amidst people who needed to hear about Jesus. During their ‘train ride’, the teenagers heard about the 2.8 billion people who do not know Jesus; most of the teenagers were shocked. “We didn’t know about this,” or, “This has to be changed,” were their most common reactions. Once they reached their destination—Global Village—they encountered all sorts of people, many with different lives and backgrounds but all in need of a loving Saviour. At the end of their travel with Scatter Railways, teenagers were brought to the OM stand in the TS Interaction Zone, where they could take a fun picture in front of a green screen loaded with photos from around the OM world. There, they also heard more about OM and missions. “We are amazed that over 100 teens already signed up to get more information about Teens in Missions,” Daniel said. Mpumi Maweni (South Africa), who serves with OM in Europe, was one of the mobilisers at the OM stand. Even before the first group of teens came from GV to the OM stand, he shared about OM and missions when he met a group of Portuguese girls who started to ask some questions. When they found out that Mpumi was a missionary, he shared his story. Only God could choose—out of the thousands of people at TS—a girl who had gone to a seminar held by a GV mobiliser, sat at lunch with another and then went back to the first person to have coffee with her, because she wanted to talk about her future. Through GV and divinely appointed meetings, the gospel of Jesus was scattered across TS; now it will spread into the homes and schools of all the teenagers and adult volunteers, and, eventually, around the globe to the least reached. Because 2.8 billion people still need to hear about Jesus.